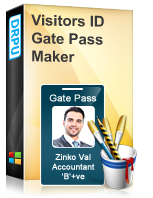 Visitors ID Gate Pass Maker Software provides E-mail setting feature to send created visitor ID cards and Gate Pass at specified email address. Software also manages all visitor's details and provide facility to search visitor's records according to Name, Company Name, Date Range etc. as per your requirements.